a little overwhelming to put it mildly…. Remember a few years ago, you were looking for whole wheat bread? Now you’re looking for gluten-free bread? And fiber content – how much? Are there too many carbohydrates in bread? In a nod to simplifying nutrition, I’ll recommend the one bread I think most people should be looking at. Whether bread is good for you or not seems to be a hot button issue and we hear all sides of the debate. Honestly, we don’t see it as black and white in our practice. Seems to work for some, not for others… depends on YOU. There is a huge spectrum of quality though, that certainly leaves an overwhelming majority of breads in one of the “nothing but straight sugar once it passes your teeth” or “full of crap that’ll make you sick” or “hey, it’s cool that it never expires, but it’s also, not food” categories. 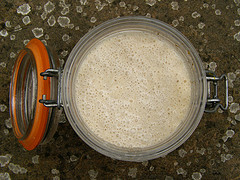 The process of making a sourdough starter takes time and great sourdough starters are handed down from generation to generation. (As a foodie, I have such romantic ideas of the beautiful ceremony surrounding the gifting of the starter… in reality, I have friends all the time sadly recount tossing their family’s 60-year-old starter in the trash.) This traditional method for making sourdough creates a bread with a broad array of beneficial probiotic strains (Fresh Dirt on Digestion), making it more easily digested and ideal for digestive health. Here are some recommended brands (many you can find from your local health food store) that are using a traditional fermentation process. If you have other suggestions–please let me know! You can also make your own! I highly recommend Jenny’s Get Cultured online class. 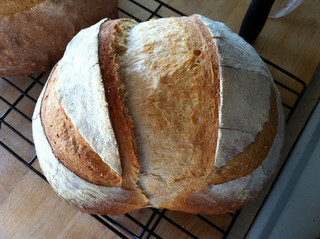 Here’s a great DIY sourdough recipe from Nourished Kitchen to get you started. If you know me well enough, you know I’m not a hardline-pusher of quick-fix diets, calorie counting, or “every-one must eat this way” diet teams, so I won’t wade into that broad part of the bread debate here. Simply put, though… the overwhelming majority of breads in the grocery store are not worth your time, your money or your health… Beyond the issue of quality, I find the issues around bread are multifactorial and depend on what works for YOU. So, if you choose to eat bread, make a wise choice. Taste and feel the difference with traditionally-fermented sourdough.